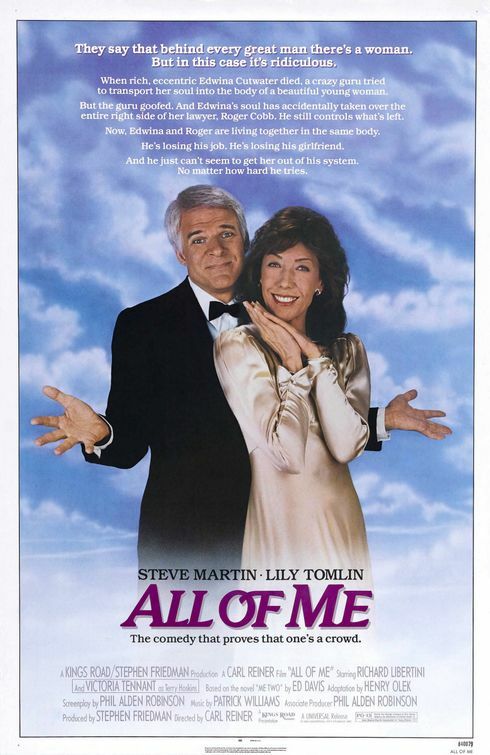 I think we can all agree — Steve Martin movies usually rock. I’ve seen most of them multiple times. But one of my favorites has been nearly impossible to find, on basic cable or premium channels, until this week. All of Me was released in theaters when I was still in college (translation: a long, long time ago). It tells the story of Edwina Cutwater, portrayed by Lily Tomlin, a millionaire who has been sickly her entire life. As she faces an untimely death, Edwina enlists the help of a Tibetan master to transfer her soul into the body of a healthy, younger woman. Martin plays Edwina’s lawyer, who accidentally gets in the way and suddenly finds her soul in his body, each of them in control of one side. It is physical comedy at its hilarious best, with Martin and Tomlin playing off of one another perfectly. This week Ovation Channel brings All of Me back to cable. It airs tonight at 9:00pm ET (and probably lots more times to come). Just wanted to get the word out. I’m recording it, of course, so I will have a copy for keeps. Time to wear out this Martin classic, too.